An early start today, heading eastwards into possibilities. While other parts of Scotland hide under a blanket of snow, we smile through grey cloud and mist. Wrapped up warm against the biting wind, and catching the occasional snowflake amidst the rain. The locals are dressed for the weather – shaggy coats keeping them warm. Layers insulating them from the worst this land can throw at you. They look ferocious – but are nosy, curious, friendly beasts. Just beware of the horns! 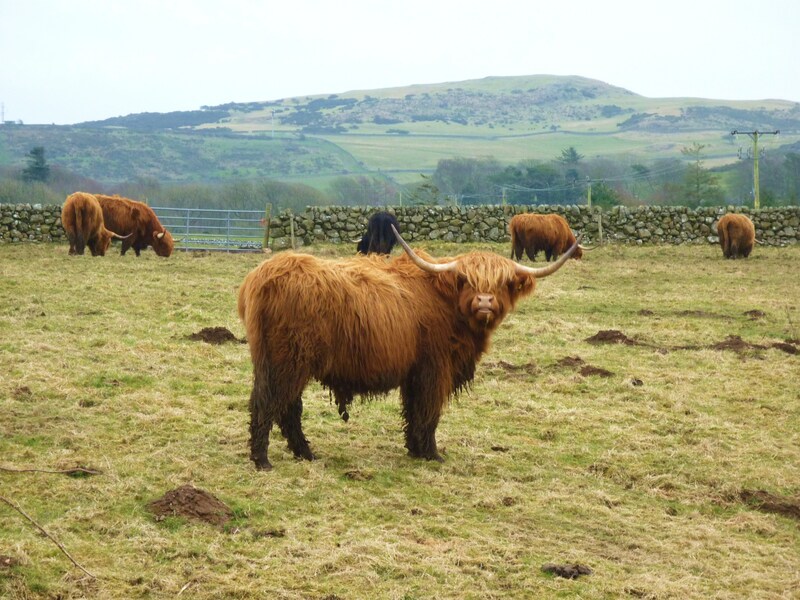 Categories: creation, enjoyment, life, nature, prose / poetry, scotland, winter | Tags: highland coos, highland cows, locals, scotland, shaggy coats | Permalink. Frosted grass at dawn in pale light. Mysterious flurries of snow, white flakes against a bright blue sky. 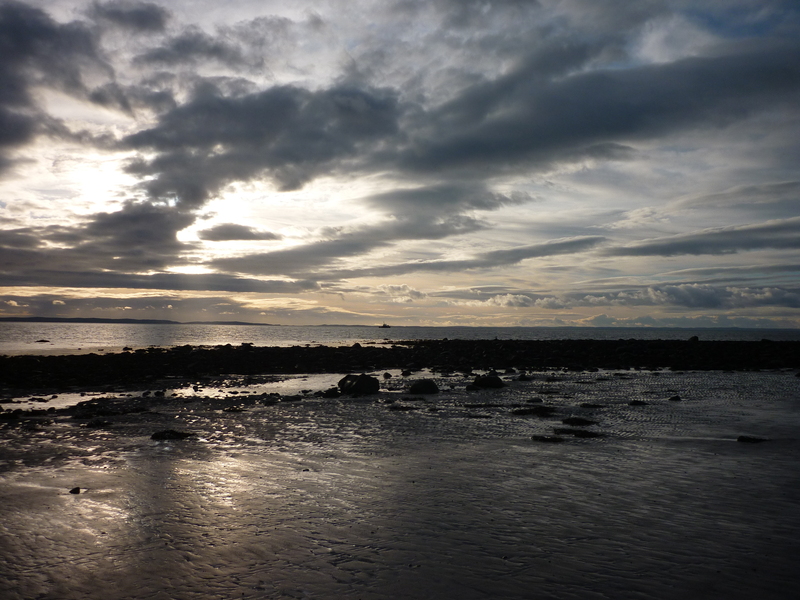 Darkening day – mercury clouds drifting across above. Silver sunset reflected on glowing sands and silken water. A small boat floats at anchor, riding lights like jewels in the twilight. Darkness wraps around, cloak of stars sparkling in deep blue heavens. Slumber awaits. NB: a safe return to base from my travels… I’ll catch up on all the blogs shortly…. it’s good to be back! Categories: creation, enjoyment, life, musings, nature, peace, Port William, prose / poetry, scotland, winter | Tags: darkness, scotland, silver, snow, winter | Permalink. The weather here is much more volatile than up on the south-west coast of Scotland. In the last week the temperature has plunged below zero several time. We’ve had high winds, freezing fog, rain, mist and sun. The washing has frozen on the line, and almost been blown across the valley. The mountains have been covered with snow one day, and the next has been bright sunshine. The dog and I have basked in the spring temperatures of 11 or 12. In the south facing sun-lounge in this house, the temperature has reached a hot 24 degrees occasionally. The plants don’t seem entirely sure what to do – open out or retreat back into the soil. Today seems to have settled on spring again. 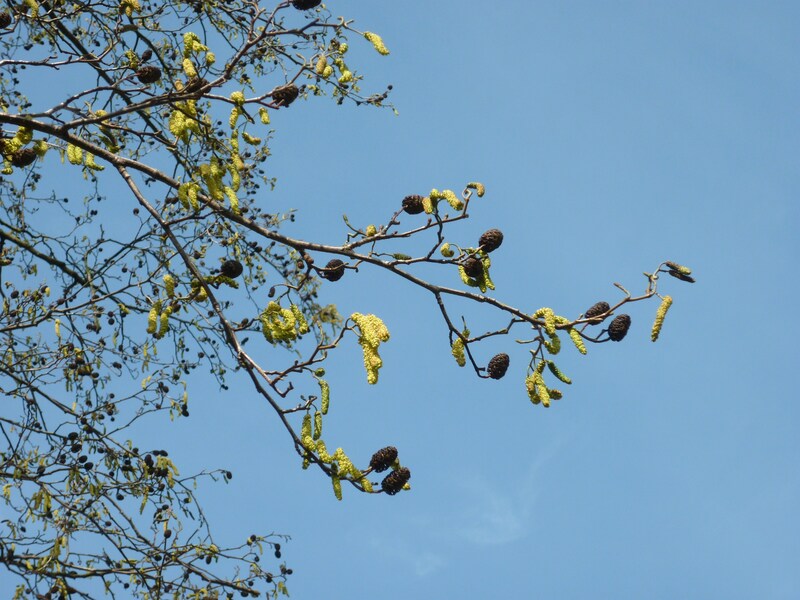 Down in the park, the catkins are dangling, looking like miniature caterpillars. And in the garden, the daffodils have emerged with trumpets blazing, just in time for St David’s Day. Dydd Gwyl Dewi Hapus! Happy St David’s Day! Off on my travels again tomorrow, leaving the dog behind in the care of one of other ‘aunts’ to await her owners return on Monday. I’m going to miss having the dog to look after. I’m heading to the south of England to help a friend clear out her mother’s house. Her mum has just died at the age of 100. A fair age, and a death more of a release than a sorrow. But with the traveling and the sorting, it may be a week or so before I blog again… or it might be tomorrow! Categories: creation, dog walking, enjoyment, life, musings, nature, prose / poetry, spring, wales, winter | Tags: catkins, dydd gwyl dewi, season, spring, st david's day, Wales, winter | Permalink. The stream has overflowed on to the road. Frozen water coats the surface. Gingerly I cross, digging each step into the iron hard ground. Heavy clouds hover over the valley, silver light reflecting from the estuary. The first flakes of snow spiral down, dancing around me as I walk. Despite hat and gloves, the wind nips at my nose, and toes and fingers start to freeze. I turn for home, hoping to arrive before the storm begins in earnest. Categories: creation, dog walking, enjoyment, life, musings, nature, prose / poetry, wales, winter | Tags: cold, conwy, frost, poetry, prose, snow, Wales, winter | Permalink. Winter’s hues still wrap the hillside. Grey rocks frosted in the shade. Rust bracken burnished under morning sun. Yet spring shyly pokes through. Under the dry blanket of old leaves green hope shines bright. Categories: creation, dog walking, enjoyment, life, nature, prose / poetry, wales, winter | Tags: bracken, conwy mountain, poetry, prose, rust, spring, Wales, winter | Permalink. The grey slab rears up on top of the mountain, a landmark to focus on. Slowly I pant my way to the top of the track. The dog runs ahead – and back – and ahead again. At last I reach the summit. Relaxing, I rest my back on the sun-warmed stone. Face turned to the winter sunlight. From here Eryri is seen in all its beauty, snow-dusted peaks glowing. Behind me the sea is blue under clear skies. 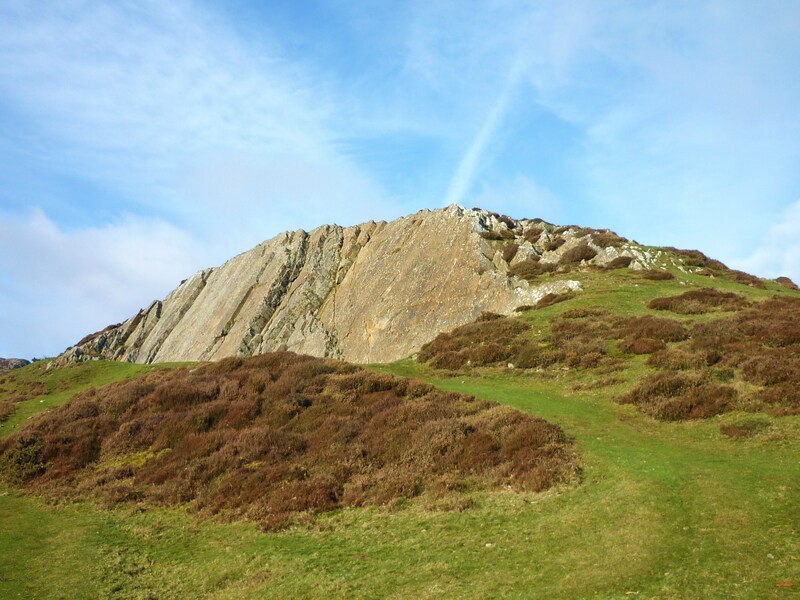 The Great Orme stretches out lazily in all its glory. Dog growing impatient, I shoulder my rucksack and move onwards, savouring the view. NB: Eryri is the Welsh name for Snowdonia. 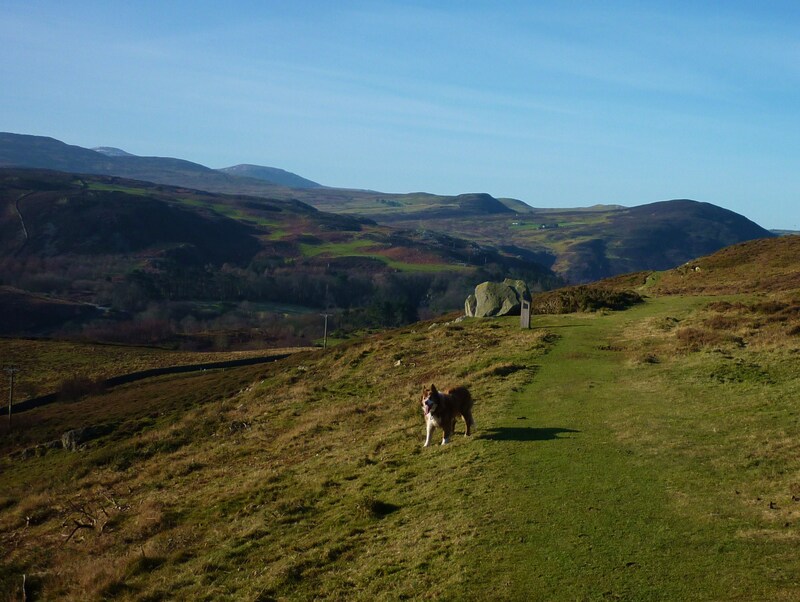 Categories: creation, dog walking, enjoyment, life, musings, nature, prose / poetry, wales, winter | Tags: conwy, eryri, mountain, poetry, prose, snowdonia, sunshine, warmth, winter | Permalink. The mud-flats are exposed today. Streams channel their way out to join the river. 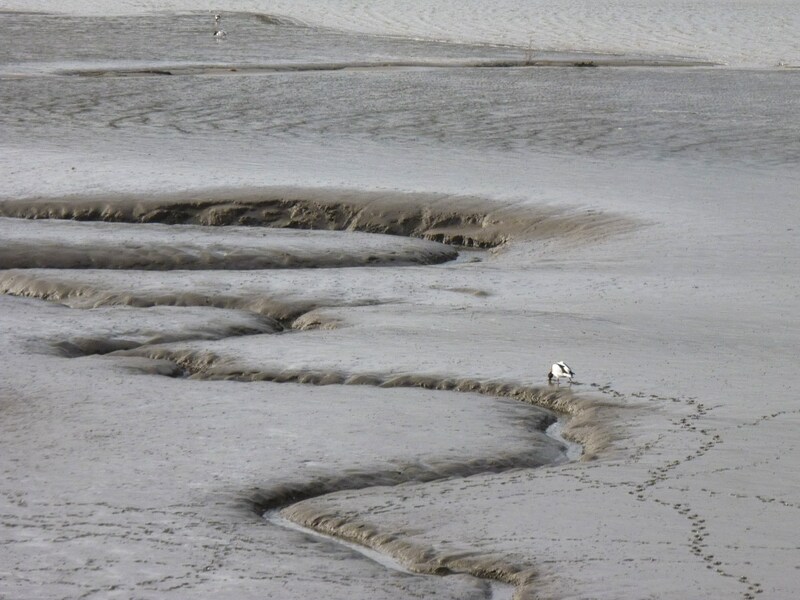 The clean-washed sand is covered with tracks from the seabirds. And the ducks. White and amber shelducks puddle their way out to the freshwater, hunting for food. 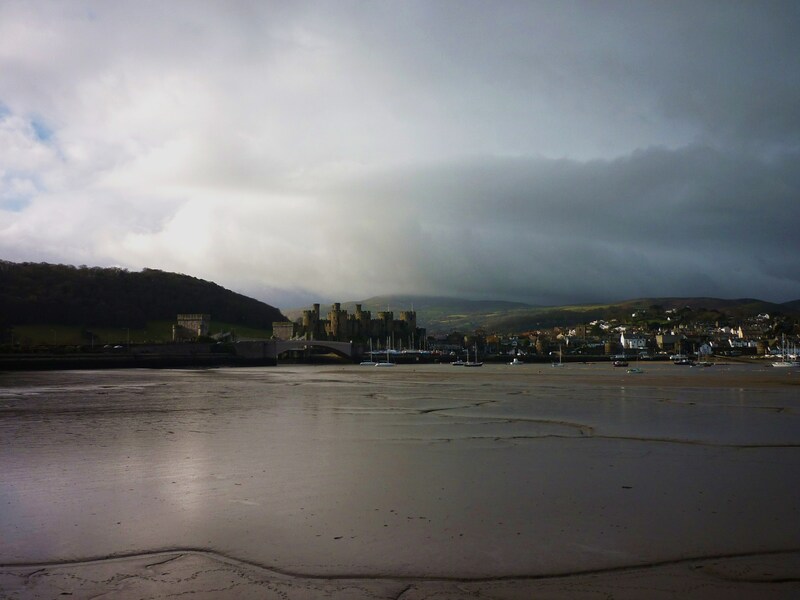 Categories: bird, creation, enjoyment, life, musings, nature, prose / poetry, wales, winter | Tags: conwy, estuary, low tide, mud, poetry, prose, river, shelduck, Wales, winter | Permalink.